Product #60668 | SKU WLC-T03-FIZ | 0.0 (no ratings yet) Thanks for your rating! 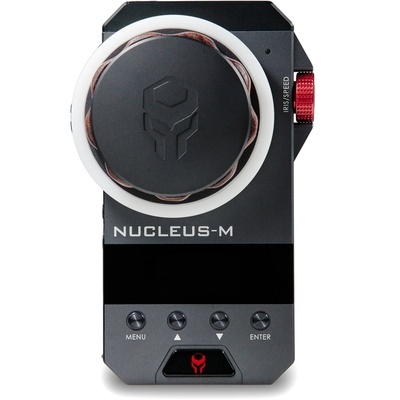 The Tilta Nucleus-M FIZ Hand Unit provides three-channel wireless focus, iris, and/or zoom control as part of the Nucleus-M lens control system. The hand unit features a large wood-edged focus knob, a zoom joystick, an iris wheel, and a backlit LED display window. Select from low, medium, and maximum transmission ranges to best suit your working distance and battery reserves. The Nucleus-M FIZ Hand Unit's choice of 15 2.4 GHz channels minimises the chance of interference in high-traffic areas. Set up to 10 soft stops with vibration for focus pulls, and calibrate lenses automatically or manually. Wireless run/stop is available for select cameras using the hand unit and separately available cables. The hand unit is powered by two separately available lithium-ion batteries and can operate for up to 10 hours on a single charge.